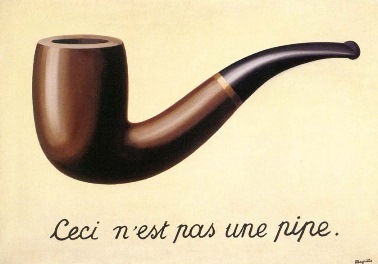 Words are not ideas, anymore than the picture above is a pipe (it’s a picture of a pipe). When we communicate about ideas we are forced to use words (or gestures or images, which are also not the ideas themselves), and so consequently we are never communicating ideas directly. We communicate about ideas through the medium of language. It is possible for someone to learn the words that represent an idea without learning the idea themselves, even so much as to be able to mimic the output expected of someone who understands the idea. This happened to me. I learned about linear functions in school. I learned about “constant rates of change” and “y = mx + b” and “find the rise over the run” and many other phrases which were connected to finding and subsequently graphing the equation of a line. I even later learned how to think of a specific line as a transformation through a translation and a rotation from any other line. However, in a fourth year topology class, my professor used a completely different set of words. He said, “Let’s do an easy example. We have line segment AB and line segment CD, and our objective is to find the mapping function from AB to CD. Think about that problem and bring your work to next class.” Well, I spent a week thinking about that problem and could not do it. I spoke to my professor about it, and he gave me a look and told me that it was “not my fault, this is unfortunately due to how you were taught.” Note how I was earlier able to articulate “transform one line into another”, but not able to repurpose this information to create a function. It turns out, the solution is a linear function. Here I am, many years later, with a much better understanding of the wide range of things in our world which are linear functions. In fact, in only a few minutes, I am now able to “prove” to myself (at least experimentally) a more general version of what my professor asked me to prove all those years ago. I have moved past a “just the words” understanding of linear functions into a more flexible and useful understanding. This is the objective of good mathematics teaching, and the reason why I think that we need far fewer lists of things to achieve with our students, and far more time spent looking at very similar things but in a very wide range of contexts. We need to move past students learning about the words that represent mathematics and giving them enough time to actually learn about the corresponding ideas. Thank you for this post! It took me back to the mid 1970’s when I was a math major at the University of Texas. The most memorable class that I took was Linear Algebra and the only text book that I saved over the years was my linear algebra text that described homomorphisms and isomorphisms. That book survived probably 15 moves and evidently did not make the cut in my last move this past fall, since I can’t find it on my bookshelf in my new condo. My memory of the course was that it did not seem linear, nor did it seem like algebra. Perhaps it was because I had a crush on the professor, or the book was especially well-written, but for whatever reason, I loved the course. It also was a big wake-up call that what one studies as a math major is not what one studies as a high school student. In 1979, I married a Vermonter and moved from Houston, Texas to a small town in Vermont with no job lined up. I had told someone that I was a math major in college. I got a call in August two weeks before school started asking if I wanted to teach high school math as one of the teachers had suffered a nervous breakdown and would not be available. I took the job, having had NO education classes and having not had high school math in 10 years. Wow, what a wake-up call. I was a REALLY bad high school math teacher at first. Luckily, I grew to love teaching math as much as I had loved Linear Algebra. Thank for you the Geogebra applet. Back in the day, those transformations were mental exercises. Now we can actually see the impact that the different parameters have on the image. Wow! Yes, creating the applet convinced me that I was on the right track. This is my first version of it, which I was able to demonstrate to myself was not the correct transformation. ‘Linear’ is probably the most used and least understood word in all of math. In this case it is referring to a linear transformation or mapping, and the bit that really matters is that ratios are preserved. So if AB and DE are the line segments, and C is a point between A and B, then where is the matching point F between D and E ? Well, to preserve ratios we will need to ensure that AC/AB = DF/DE, or rearranged as DF/AC = DE/AB = fixed. So for any proportion r of the line AB, taken from the A end and representing the point C, we must have the same proportion of DE to represent F.
If points are viewed as vectors then the point C is rB + (1 – r)A , a linear combination. Taking the same proportion r on DE we get F = rF + (1 – r)E , and the mapping C –> F is linear. This should be easier to code up in Geogebra, and also will allow independent positioning of the endpoints of the two line segments. I was mystified by the relationship beween your six parameters and the positions of D and F.
I really wanted to put in a diagram!!!!! Simpler problem: The two line segments have an end in common. Solution almost trivial!!! It doesn’t help that the word ‘Linear’is overloaded. Higher math: A linear function f is one for which the statement f(a+b) = f(a) + f(b) is true for all arguments a and b. A quick calculation using f(x) = 3x + 2 shows that this f is not a linear function in the higher math sense. My name is Savannah Rhodes, and I’m a student in EDM 310 at the University of South Alabama. I really enjoyed reading this post, and all of your thoughts on this subject. I definitely agree with you that teachers need to try to “move past students learning about the words that represent mathematics and giving them enough time to actually learn about the corresponding ideas” so students can develop a true understanding of the different concepts, and how they work together! It was encouraging reading about how you overcame your struggles in your topology class, and I’ll be featuring your blog over on my class blog so I can share some of your work and advice with other future math teachers. I’ve found a lot of the information to be super helpful. Thanks again for this post!